I really loved how close it was to my job and how everyone pretty much stayed to themselves. I also liked that I didn't have to walk far to the washroom for our clothes. Didn't eat any breakfast nor drink any coffee. Very quiet, with all you need to feel at home. But, I could not find an iron. Accessibility to many stores and restaurants around the location. Also the mall was very close as well. And anything farther than that is at least 15 to 20 minutes away. There was a lot of noise and I was woke up at about 6 am by 6 police men knocking on my door. They had a small child they had found and was going door to door at the hotel looking for its mother. The location and price were great. Close to freeway, light rail and restaurants. Rooms were even a decent size. RUN AS FAST AS YOU CAN FROM THIS HOTEL!!! DIRTY PILLOW CASES, DIRTY SHEETS, DIRTY RR!!! I LITERALLY STAYED UP 3HRS AFTER ARRIVING AFTER 1AM. I'VE NEVER STAYED WHERE I WAS AFRAID OF MY SKIN BEING IN CONTACT WITH ANY PART OF THIS HOTEL! I WISH I COULD UPLOAD A PIC MY HUSBAND TOOK AFTER I FINALLY FEEL ASLEEP!!! OMG PLZ RUN!!! 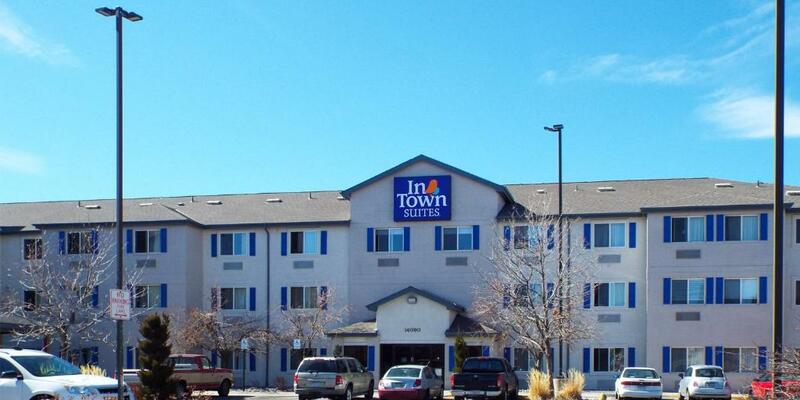 InTown Suites Extended Stay Denver/Aurora I-225 This rating is a reflection of how the property compares to the industry standard when it comes to price, facilities and services available. It's based on a self-evaluation by the property. Use this rating to help choose your stay! One of our best sellers in Aurora! A fully-equipped kitchen is featured in all suites at this Aurora hotel, just 10 minutes’ drive away from the Denver Tech Center. A separate seating area with spacious work desk/dining table and cable TV with premium channels is offered in each suite at InTown Suites Southeast Aurora. 24-hour laundry facilities are located on site. Business services are offered. Aurora Mall is 3 miles away. Buckley Air Force Base is 9 miles away. Denver International Airport is 20 minutes’ drive away from InTown Suites Southeast Aurora. 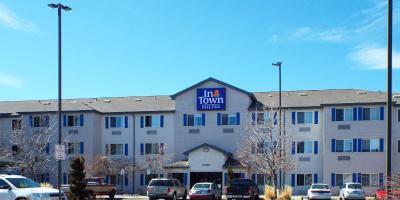 When would you like to stay at InTown Suites Extended Stay Denver/Aurora I-225? A cable TV with premium channels,a work desk and a full kitchen are featured in this suite. House Rules InTown Suites Extended Stay Denver/Aurora I-225 takes special requests – add in the next step! InTown Suites Extended Stay Denver&#47;Aurora I-225 accepts these cards and reserves the right to temporarily hold an amount prior to arrival. InTown Suites Extended Stay Denver/Aurora I-225 accepts these cards and reserves the right to temporarily hold an amount prior to arrival. Please note that the minimum check-in age is 21 years of age. Please inform InTown Suites Extended Stay Denver/Aurora I-225 of your expected arrival time in advance. You can use the Special Requests box when booking, or contact the property directly using the contact details in your confirmation. Bed bugs and dirty facility. It was dirty, the room/hotel needs major renovation. The carpet in the hallway was so filthy that you could not tell what color it was. It was better than sleeping in the streets. The room was dirty and smelled of urine. We checked in daily for 3 days. The last day we were told it was paid for then got a call and was told they made a mistake. Not fair telling a guest the room was paid for then calling to tell them "haha just joking". The smell on the first floor smells like they had bad water damage. Not clean. stains on sheets. Bathroom was discussing. Place was was very dirty. Smell like cigarettes. I never got my room cleaned or vacuumed the draws are falling off and never got clean towels..